Winnie Harlow was born Chantelle Brown-Young on July 27, 1994, in Toronto, Ontario, the daughter of Lisa Brown and Windsor Young. She is of Jamaican ancestry and has two sisters. She was diagnosed with the chronic skin condition vitiligo, characterized by depigmentation of portions of the skin, at the age of four. Harlow was a victim of bullying by other children and was reportedly called a "cow, zebra, and all manner of other disparaging slurs" throughout her childhood by students both black and white. The verbal harassment led to her changing schools numerous times and dropping out of high school, after which she contemplated committing suicide. Harlow was discovered by America's Next Top Model host Tyra Banks on Instagram, and subsequently became one of the fourteen finalists of the twenty-first cycle in 2014. She was the first and only Canadian ever cast on ANTM. She was eliminated in the second week of the finals, and participated in a separate competition called the "comeback series", where she continued to participate in the cycle's photo shoots along with the other eliminated contestants in an effort to return to the competition. After completing the comeback series, she was revealed to have received the highest average public vote score, and returned. She was eliminated again in episode 13, placing sixth overall. Following her elimination from America's Next Top Model, Harlow modelled for the Spanish clothing brand Desigual and became their official brand representative. In September 2014, she walked and closed for the clothing brand Ashish for their spring/summer 2015 collection in London Fashion Week. She has modelled for fashion magazines such as i-D and Dazed, and for the fashion website Showstudio.com. In 2015, Harlow modelled for the Italian clothing brand Diesel for its spring/summer 2015 campaign, which was shot by British fashion photographer Nick Knight. She modelled for the Spanish and Italian editions of Glamour magazine and was featured in the August/September 2015 issue of Complex magazine. She was also featured in the August 2015 issue of Cosmopolitan. She was featured on Vogue Italia's website in an interview and accompanying photo shoot. In August 2015, Harlow shot the cover of and an accompanying editorial spread in the September issue of Ebony magazine, where she appeared alongside former America's Next Top Model contestant Fatima Siad. In 2016, Harlow was featured in a commercial for Sprite, and was featured in a campaign for Swarovski. The same year, she was chosen as one of BBC's 100 Women In 2018, she modeled at the Victoria's Secret Fashion Show. In July 2011, Harlow posted a video titled "Vitiligo: A Skin Condition, not a Life Changer" on YouTube. She talked about the condition and answered questions about her life living with vitiligo. In November 2014, Harlow spoke in a TED presentation, recalling her experience with it. She was presented with the 'Role Model' award at the 2015 Portuguese GQ Men of The Year event. She has made controversial statements on other models' appearance. At the 2018 Canadian Grand Prix, Harlow was invited to wave the chequered flag, signifying the end of the race. A miscommunication between race officials led to Harlow being instructed to wave the flag on what should have been the penultimate lap of the race. As a result of the application of the Formula One sporting regulations, the final result was declared based on the positions at the end of lap 68 (i.e., the official race distance was shortened by two laps from the scheduled distance of 70 laps). The error did not seriously impact the race result. Harlow has appeared in music videos; these including JMSN's "The One", Eminem's "Guts Over Fear", and The Black Eyed Peas' "#WHERESTHELOVE". She cameoed in Beyoncé's "visual album" Lemonade and was in one of Lilly Singh (a.k.a. IISuperwomanII)'s videos on YouTube named "Three Girls, One Elevator". 2014 Access Hollywood Episode: "June 26, 2014"
2015 Prominent! Episode: "February 13, 2015"
Primetime: What Would You Do Episode: "Friday, June 12th"
^ a b c d Rodney, Dave (February 25, 2014). "From Suicide Thoughts to America's Next Top Model Finalist". jamaica-gleaner.com. Gleaner Company. Archived from the original on March 22, 2015. Retrieved April 4, 2015. ^ a b c Barlow, Eve (2015-02-15). "Chantelle Winnie: 'I'm proud of my skin'". The Guardian. Archived from the original on 15 August 2015. Retrieved 11 August 2015. ^ Fleming, Kirsten (September 9, 2014). "Model with rare skin disease changing the face of fashion". nypost.com. New York Post. Archived from the original on April 2, 2015. Retrieved April 4, 2015. ^ Kwiatkowski, Elizabeth (September 9, 2014). "'America's Next Top Model' cuts Chantelle Brown-Young from the competition". RealityTVWorld.com. Reality TV World. Archived from the original on July 16, 2015. Retrieved June 23, 2015. ^ a b Kwiatkowski, Elizabeth (October 29, 2014). "'America's Next Top Model' eliminates Mirjana Puhar, welcomes back Chantelle Brown-Young". RealityTVWorld.com. Reality TV World. Archived from the original on June 23, 2015. Retrieved June 23, 2015. ^ a b c "Winnie Harlow: Canadian Model With Rare Skin Condition Lands 2 Major Campaigns". Complex. Archived from the original on 24 September 2015. Retrieved 11 August 2015. ^ "Canadian Model With Skin Disorder Gets Another Sweet Gig". The Huffington Post. Archived from the original on 2015-08-05. Retrieved 2015-08-11. ^ Theo (September 17, 2014). "Model Suffering from Vitiligo Scores Desigual Campaign". fashionmodelirectory.com. Fashion Model Directory. Archived from the original on April 6, 2015. Retrieved April 4, 2015. ^ "Winnie Harlow - Model". MODELS.com. Archived from the original on 2016-06-20. Retrieved 2016-06-01. ^ Models (May 2014). "Winnie Harlow". models.com. Models. Archived from the original on July 15, 2015. Retrieved June 23, 2015. ^ Goedluck, Lakeisha (February 1, 2015). "Winnie Harlow stars in Diesel's new campaign". dazeddigital.com. Dazed. Archived from the original on February 11, 2015. Retrieved April 4, 2015. ^ "Vídeo: Winnie Harlow, el valor de ser diferente | Glamour". Glamour.es. 2015-03-16. Archived from the original on 2016-03-04. Retrieved 2016-12-10. ^ "Editorials. Chantelle Winnie. Glamour Italia June 2015. Images by Giovanni Gastel. | SUPERSELECTED - Black Fashion Magazine Black Models Black Contemporary Artists Art Black Musicians". Superselected.com. 2015-05-26. Archived from the original on 2017-06-05. Retrieved 2016-12-10. ^ Karizza Sanchez (2016-12-06). "Model Winnie Harlow Talks Drake, Vitiligo, and Embracing Your Own Skin | Complex UK". Uk.complex.com. Archived from the original on 2016-08-04. Retrieved 2016-12-10. ^ "Model Chantelle Winnie Remembers Getting Beat Up Because of Her Vitiligo". Cosmopolitan.com. 2015-07-14. Archived from the original on 2016-09-02. Retrieved 2016-12-10. ^ Lucia D'Angelo (2015-07-23). "Chantelle Winnie". Vogue.it. Archived from the original on 2017-04-30. Retrieved 2016-12-10. ^ "Ebony Magazine September 2015 Pays Homage To Female Black Models". Donbleek.com. Ebony. 24 August 2015. Archived from the original on 29 August 2015. Retrieved 29 August 2015. ^ "YouTube". YouTube. Archived from the original on 2018-03-19. Retrieved 2016-12-10. ^ "SWAROVSKI – Introducing the "Swarovski Crystaldust Crew" with Winnie Harlow". YouTube. 2016-07-26. Retrieved 2016-12-10. ^ "BBC 100 Women 2016: Who is on the list? - BBC News". Bbc.com. 2016-11-21. Archived from the original on 2016-12-23. Retrieved 2016-12-10. ^ Duboff, Josh. "Winnie Harlow on Her First Victoria's Secret Fashion Show: "We Just Need to Keep Focused on Taking Steps Forward"". Vanities. Retrieved 2019-02-21. ^ a b "GQ Men of the Year 2015". metro.co.uk. Metro. October 19, 2015. Archived from the original on June 3, 2016. Retrieved June 1, 2016. ^ a b c Edmondson, Laurence (2018-06-11). "FIA explains chequered flag mix-up in Canada". ESPN. Retrieved 2018-06-14. ^ "Vitiligo Model Chantelle Brown Young Stars in Music Video for JMSN | SPICE TV". myspice.tv. Archived from the original on 2016-07-29. Retrieved 2016-10-23. ^ "Watch Eminem Get in the Ring for 'Guts Over Fear' Video". Billboard. Archived from the original on 2016-10-12. Retrieved 2016-10-23. ^ Magazine, W (2016-04-25). "Winnie Harlow, Beyonce Lemonade Model with Vitiligo". W Magazine. Archived from the original on 2016-12-06. Retrieved 2016-10-23. ^ Spice TV (January 29, 2014). "Vitiligo Model Chantelle Brown Young Stars in Music Video for JMSN". myspice.tv. Spice. Archived from the original on June 23, 2015. Retrieved June 23, 2015. ^ Leight, Elias (November 24, 2014). "Watch Eminem Get in the Ring for 'Guts Over Fear' Video". Billboard. Archived from the original on June 23, 2015. Retrieved June 23, 2015. ^ "How Winnie Harlow Went from America's Next Top Model to Beyoncé's "Lemonade"". April 26, 2016. Archived from the original on December 6, 2016. ^ "Calvin Harris and Sam Smith's "Promises" video is a tribute to ball culture". The FADER. Retrieved 2019-04-13. ^ "Stunning vitiligo model Winnie Harlow continues to change face of fashion with 'Beauty Idol' award". metro.co.uk. Metro. March 23, 2015. Archived from the original on June 22, 2015. Retrieved June 23, 2015. 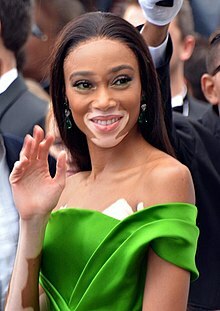 Wikimedia Commons has media related to Winnie Harlow. This page was last edited on 13 April 2019, at 02:51 (UTC).